On the Caribbean coast, there is "Isla Uvita" and "Cahuita Reef" and many other amzing sites. On the Pacific Coast, diving is nothing short of spectacular! In the "Gulf of Papagayo", there is Guanacaste which is a giant bay off the northwest coast that provides access to "Catalina" and "Bat Islands", where you may encounter several different kinds of rays, sharks (include bull sharks), Sailfish, as well as the occasional whales, dolphins. The southern area of the Pacific Coast is the famous Cocos Island - a protected biological reserve and offers the chance to eagle rays, turtles, manta rays, white-tipped reef sharks, bull sharks, enormous schools of both grunts and jacks, parrotfish, moray eels, dolphins, hammerheads, humpback whales, pilot whales even orcas and numerous other pelagics. Located in the Eastern Tropical Pacific, 342 miles southwest of mainland Costa Rica, a rugged yet incredibly verdant island. 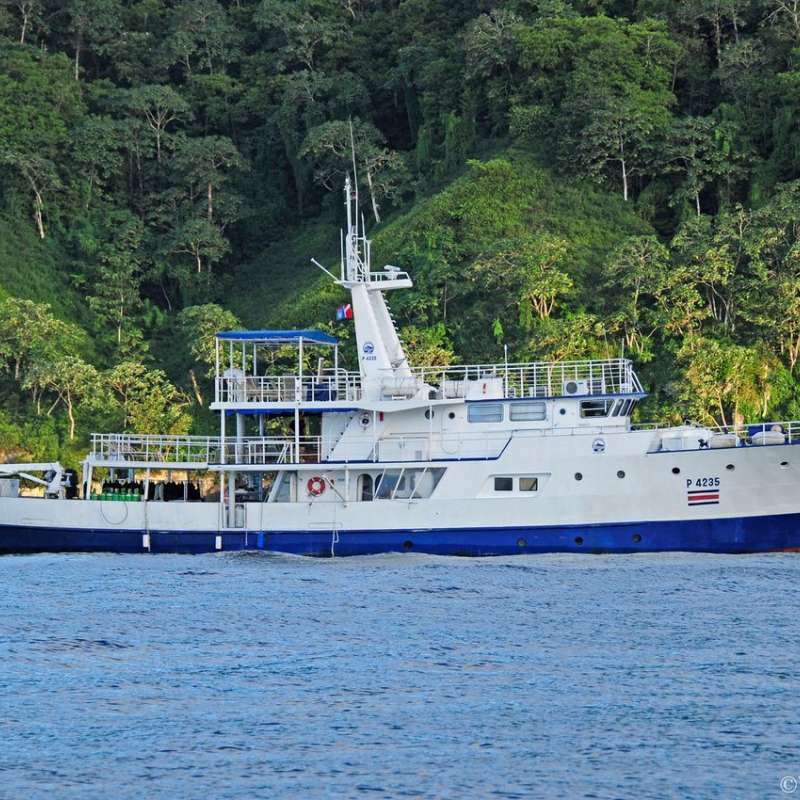 Cocos island is the beacons for big animals and big action: huge schooling hammerheads (more than 500 when we visited there in Sep 2016), large tiger sharks, galapagos shark, countless white-tip sharks, different rays includes oceanic manta rays, tuna, whale sharks, marlin, sailfish call Cocos home. 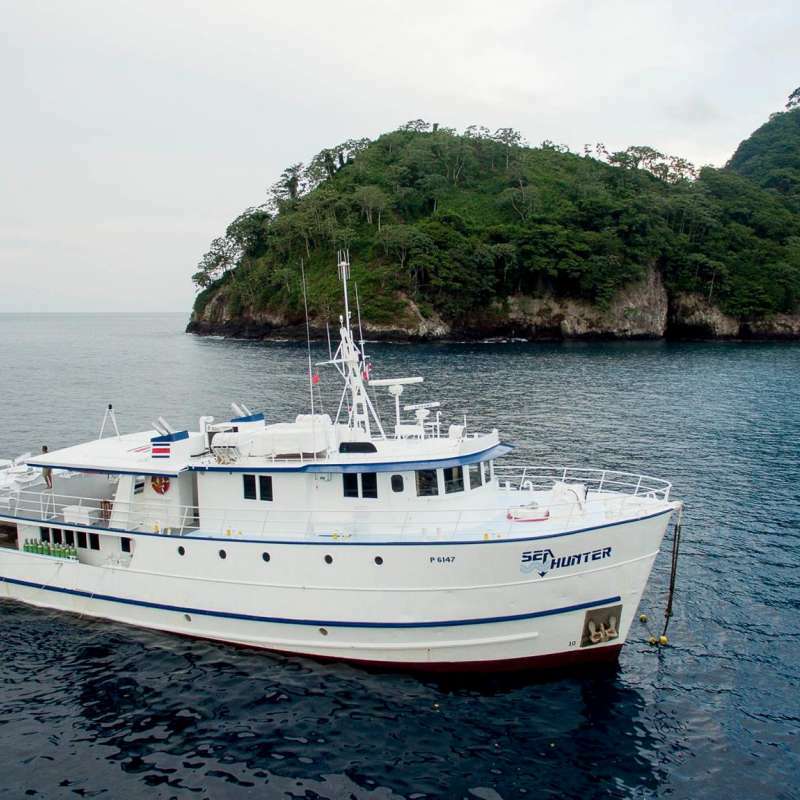 Diving in Cocos Island is definitely one of the best diving experience our Dive and Cruise team ever done! We even encounted humpback whales during a ride to Manuelita! Caño Island is a marine reserve located off the south pacific coast of Costa Rica in front of the Osa Peninsula. This green tropical island is home to resident tropical fish, beautiful colorful corals, marine flora, tuna, amberjacks, wahoo, rays, turtles, enormous schools of fish, humpback whales, pilot whales, white tip sharks, black tip sharks, nurse sharks and occasionally great hammerheads, whale sharks, marlin and dolphin can be seen. Guanacaste is a giant bay off the northwest Pacific coast, Bat Islands are located in a protected Marine Park inside the Guanacaste conservation area. This area is one of the most beautiful island chains in Costa Rica and home to a diverse dry tropical forest. 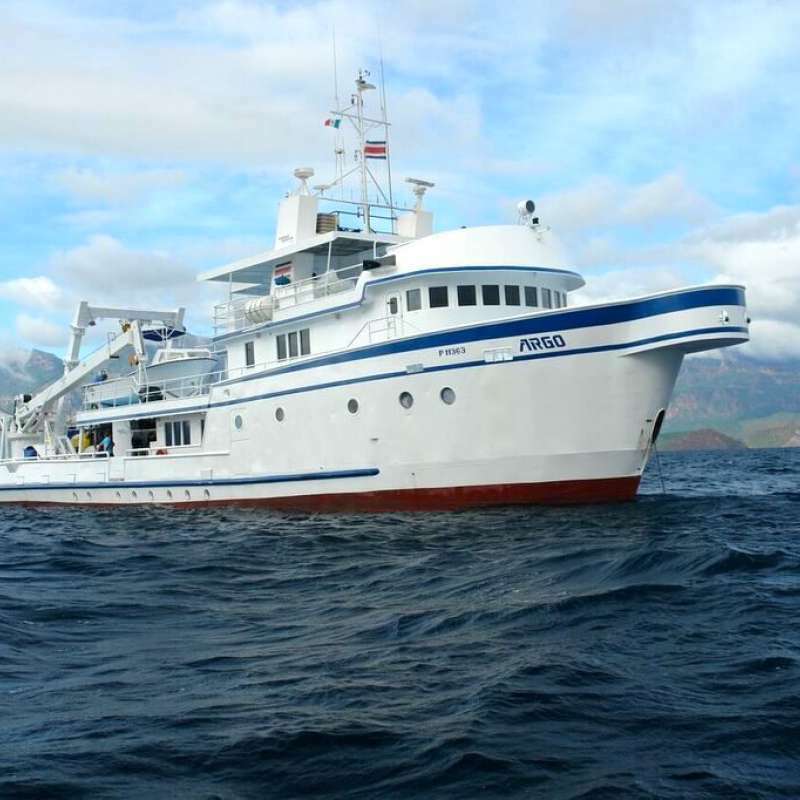 Liveaboard trips in this area usually includes three main geographical areas in the North Pacific of Guanacaste: Bahia Culebra and Catalina Islands Area, Cuajiniquil and El Jobo Area, and Bat Islands in Santa Rosa National Park. There are big chance to dive with lots of species of rays, mantas, turtles, sharks, large schools of tropical fish, frogfish and other macro life. Large pelagics such as Humpback Whales, dolphin and other shcarks are seen. 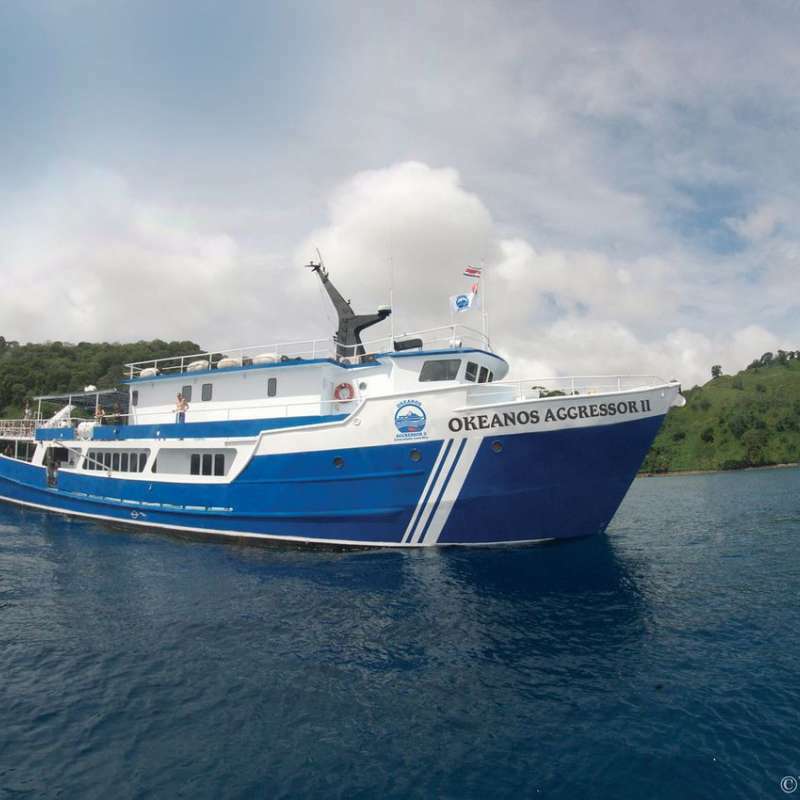 Okeanos Aggressor совершает сафари в Коста-Рике, где представляет знаменитый флот Aggressor у берегов острова Кокос и в национальном парке Каньо. Яхта предлагает высокий уровень комфорта в уютных двух- и четырехместных каютах. Корабль Argo прекрасно подходит как для стандартных дайв-сафари к острову Кокос, так и для научных экспедиций, так как служит платформой для батискафа DeepSee, погружения в котором возможны на глубину до 450 метров. Okeanos Aggressor II представляет знаменитый флот Aggressor & Dancer у берегов необитаемого острова Кокос, принадлежащего Коста-Рике. Яхта совершает дайв-сафари длительностью 10 ночей. На борту размещается группа до 22 человек. Sea Hunter прекрасно сочетает в себе стабильность и функциональность корабля, построенного для тяжелых морских работ, с комфортом и изысками современной круизной яхты для дайвинг-сафари. Размещает группу до 20 человек.